Give maximum advertising exposure to your company, organization, or school with the use of these 50 x 50 x 50 mm sticky note cubes. Each side of the cube can be custom printed in one-colour ink with your company logo or your choice of branding. 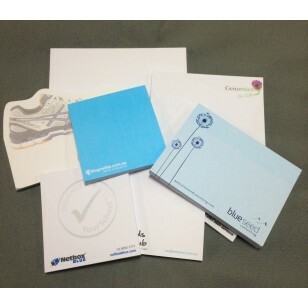 Plus, each sheet of paper can also be printed with your logo. It makes a powerful and effective marketing tool at a very economical price. These customizable sticky note cubes make wonderful gifts for teachers, staff members, family members, and customers. Hand them out on Staff Appreciation Day to show gratitude and improve employee morale. Give them to customers to maintain customer loyalty. The innate benefit of the note cube is that it keeps all its paper sheets glued together until needed. Each piece of paper can be torn off and then affixed to most surface areas with the use of its adhesive backing. This includes books, walls, file folders, computers monitors, and even refrigerator doors. This special backing also allows you to reapply that same sticky note again and again without loosing its adhesive or leaving a residue behind when removed. This can be quite handy when you need to post those messages, notes, or phone numbers in a more prominent location. These clever sticky note cubes includes the cost of the one-colour print image or wording. The sticky cubes include full colour printing on all 4 sides of the cube. (recommended print area should be no larger than 50% of the page size to allow for ample writing space), but does not include GST. Printing is done in Australia and product(s) can only be delivered to customers within Australia.